Our beard and face wash is designed to get those whiskers clean without stripping away your natural oils. Use our beard and face wash, and end up with a clean, healthy-looking beard (and face) that feels great! Decyl Glucoside - this is a mild surfactant used to help you build up a really good lather. It's especially good for those with sensitive skin and is so mild you'll find it in baby shampoo. We chose this particular surfactant because it is plant-derived (from corn and coconut), biodegradable and especially gentle. Lauryl Betaine - another mild, plant-derived surfactant that also acts as a hair and skin conditioner. It was originally extracted from sugar beets but now comes from coconut oil. Jojoba Oil - from the simmondsia chinensis plant, native to the western United States. It's a great hair moisturizer and is chemically similar to the natural oils in your skin. Vegetable Glycerin - serves as a natural humectant, which helps dry or damaged hair replenish moisture. Sodium Chloride - also known as table salt. This ingredient is used to help clean your hair. It also conditions and repairs damaged strands. Xanthan Gum - a natural thickener made by fermenting sugar. Phenoxyethanol - found naturally in green tea (but most is now synthetically produced). Used here as a preservative. Vitamin E Oil (Tocopherol)- an antioxidant that nourishes skin and hair. Also helps keep the other ingredients from oxidizing. Aloe Vera Juice Powder - a concentrate from the aloe plant. Used in our wash to help with detangling, moisturization, reducing beardruff and decreasing frizz. Fragrance & Essential Oil Blend - not used in our unscented wash but they sure smell good in the others! Citric Acid - occurs naturally in citrus fruits. Used to balance the PH of the final product. Benzoic Acid - Benzoic acid occurs naturally in plants and is used as a preservative (specifically an antifungal). Dehydroacetic Acid - a very small amount is used to prevent fungus and bacterial growth. 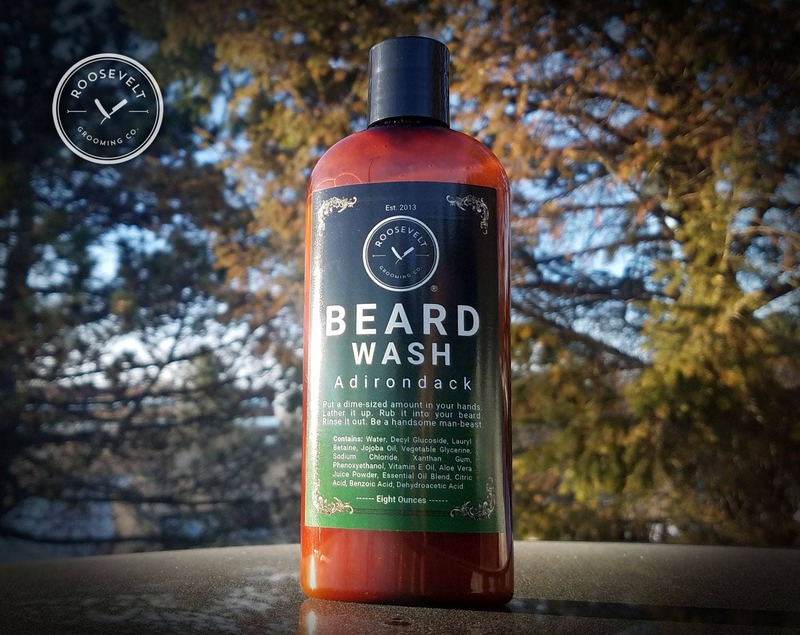 Our beard & face wash comes in a 4 or 8 ounce amber plastic bottle.